It was a very busy and not overly successful Monday ... Marcus had a week of training at work and I had my first day. finally got a clear answer ... 40 hours = $200 (before tax) a week ... were they crazy?! Needless to say all three of us left. Thankfully after an atrocious day things picked up and we settled in well to our new apartment. A few wines later I was feeling much happier ... and looking forward to my birthday the following day. Given that it usually either rains our snows on my birthday I was keen to spend my day celebrating in the sunshine, it was definitely going to be a birthday to remember! The day started well when Marcus surprised me with a bottle of my favorite perfume, I hadn't expected anything so it was a real treat along with my cards from home. After breakfast it was then time for Marcus to go off to work luckily it was only until 1-30 pm, my plan was to spend the whole day sunbathing on Surfer's Paradise beach. Time soon flew by and Marcus was soon home, after a late lunch we decided to head back to the beach to do some body-boarding. We both took advantage of the glorious weather and only returned back to the apartment when the sun had gone down! It was then time to get ready to go out for dinner. We headed straight to Broadbeach home to all of the posh restaurants. As it was Marcus's treat I was in charge of picking somewhere, surprisingly none of the posh restaurants took my fancy and we ended up heading back to Surfers. On our walk back along the highway we spotted a lovely Thai restaurant called the "Thai Beer Garden". It was definitely a good choice, the food was delicious and the service was great. Our waiter "Ivan" made the night, not only did he provide us with constant entertainment but I was given complimentary ice cream and shots as well as a home-made birthday card! We both had such a lovely evening and it was the perfect way to end my birthday day. After a lovely day-off celebrating my birthday it was back to reality. My bank balance was looking less than healthy and I really needed a job. The pressure was definitely on, so I spent the whole two days calling companies and filling out application forms. Thankfully my persistence paid off and by mid day on Thursday I had secured a interview for the following day. It was then preparation time as 'failing to prepare is preparing to fail' (Mr M Warder). Given my previous experience with Gold Coast buses I decided to allow myself 2 hours to get to my interview, I was leaving nothing to chance! Annoyingly for the first time EVER the bus was on time this meant that I was actually running an hour early! Conveniently there was a coffee shop just across the road where I sat and chilled. I went into the interview feeling well prepared and confident, however it was the most difficult and intense interview I have ever had ... I even had to do a geography test! I came away with mixed feelings not knowing whether I had done enough. Thankfully I did not have to wait too long until they called me back and offered me the position to start next week. It was such a relief and we celebrated with a bottle of champers whilst cooking our first ever Red Thai curry! Admittedly we both woke up on Saturday with sore heads, similar to our $3 white wine our $5 champagne also leaves you with a bad hangover. For Marcus's 21st Adam had bought him a para-sailing experience, luckily it was booked for the afternoon which gave us enough time to recover. We leisurely made our way to Mariner's Cove, home to all of the water sport activities. It is a lovely area with a few bars and restaurants as well. Once we arrived we had a quick briefing before boarding the boat, we were both so excited! 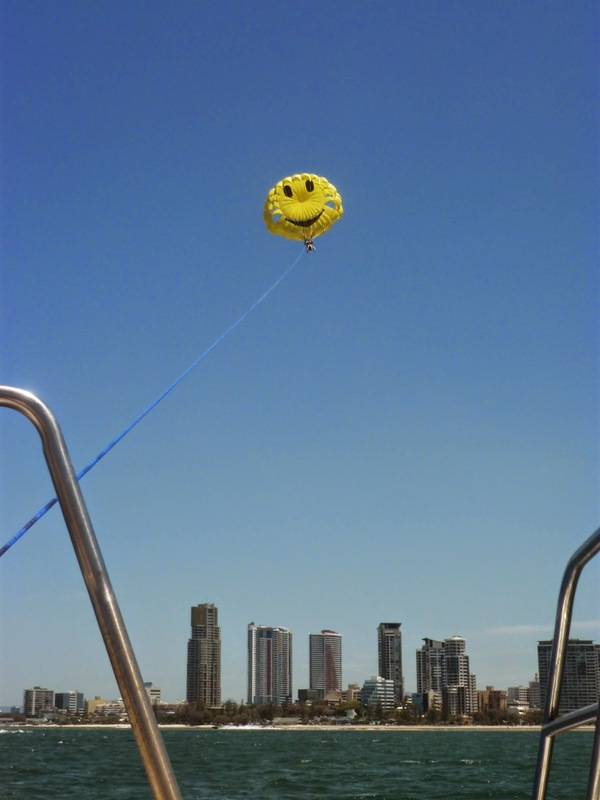 We were shot up 100 meters above the Gold Coast skyline, the views we had were incredible! We were practically flying horizontally over the sea through the clear blue sky, it was amazing and defiantly something I would do again! Afterwards we then headed back to Surfer's for a BBQ. As part of my on-going birthday celebration Marcus had planned to do a BBQ for me in Broadbeach. We found a lovely BBQ area and spent the evening cooking, chilling and drinking ... perfect! We both decided that after a hectic week, we both needed a chill out day on the beach. The weather was lovely as usual so we spent the whole day swimming and sunbathing. Our evening was also very chilled and after dinner we decided to get an early night, we both needed to be fresh as I started my new job and Marcus had work.